Taipei, Taiwan, March 24th, 2017 – GIGABYTE TECHNOLOGY Co. Ltd is proud to announce the addition of the GIGABYE Z270X-DESIGNARE to GIGABYTE’s 200 Series Family. The DESIGNARE motherboards, as the name implies, are geared towards the creative minds of content creators. This series of motherboards was first introduced in the Intel 100 Series Chipset to promote NVIDIA Quadro graphics cards. By placing it through tried and tested benchmarks with real world environment settings, the DESIGNARE motherboards are optimized for content creators of all levels. With the 200 series GIGABYTE has done it again and this time with a distinctive silver alloy PCB design and unique markings along the front and rear of the board. Just like its predecessor, the GIGABYE Z270X-DESIGNARE is fully validated and optimized for NVIDIA Quadro graphics cards and high-performance graphics to ensure designers have nothing holding them back. “Content creators need a high-performance platform that can keep up with the inventive minds as they craft their masterpieces.” – Henry Kao, Vice President of GIGABYTE’s Motherboard Business Unit. Not only is the GIGABYE Z270X-DESIGNARE motherboard the perfect canvas for any artist, it also has the technology to transfer media via the newest standards, USB 3.1. 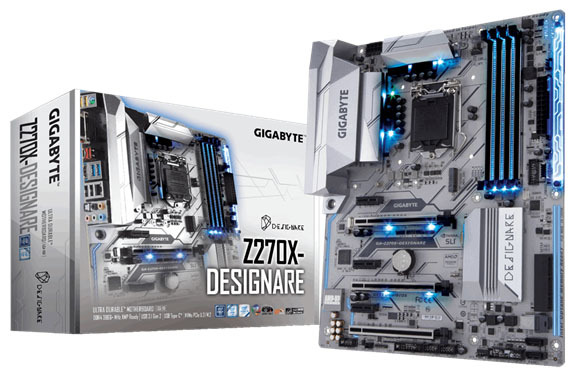 With the first onboard USB 3.1 header the GIGABYE Z270X-DESIGNARE is not only breathtaking but revolutionary.